The Olympics are here again! For the next two weeks, 2,952 athletes from around the world will compete for bronze, silver, and gold medals in 102 events in 15 disciplines such as curling, figure skating, and ski jumping. Olympians have been receiving medals since the first modern Olympics in 1896, but the bronze, silver, and gold tradition started in 1904. The top competitors in the ancient Olympic games received an olive wreath. Thinking about the different medal metals made us wonder what we had in the archives made of the three. Turns out there were some interesting finds! Let's start with third place bronze. 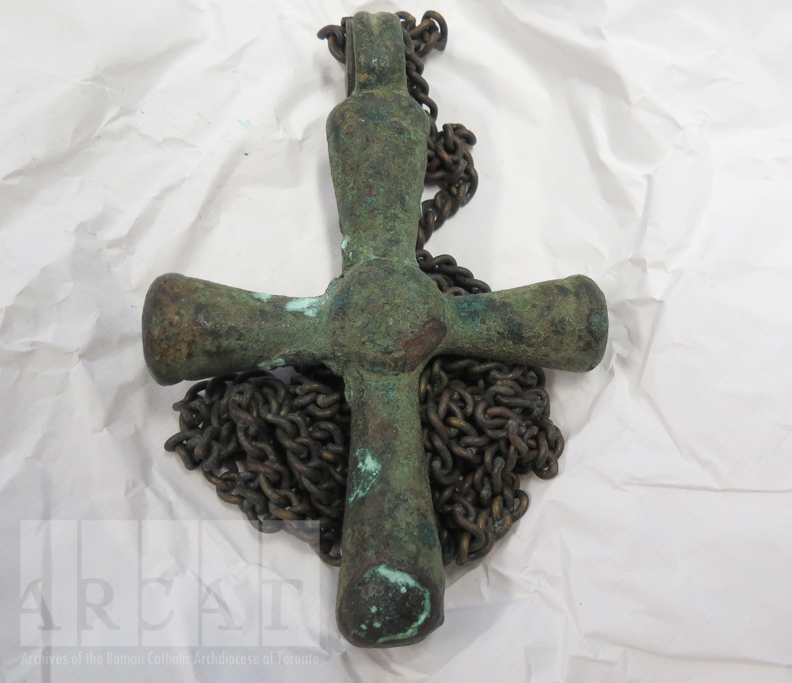 This cross and chain came from the estate of Cardinal Carter. Not too much is known about it other than the fact that it has been corroding. We hope that storage in a climate-controlled environment will mitigate the damage! 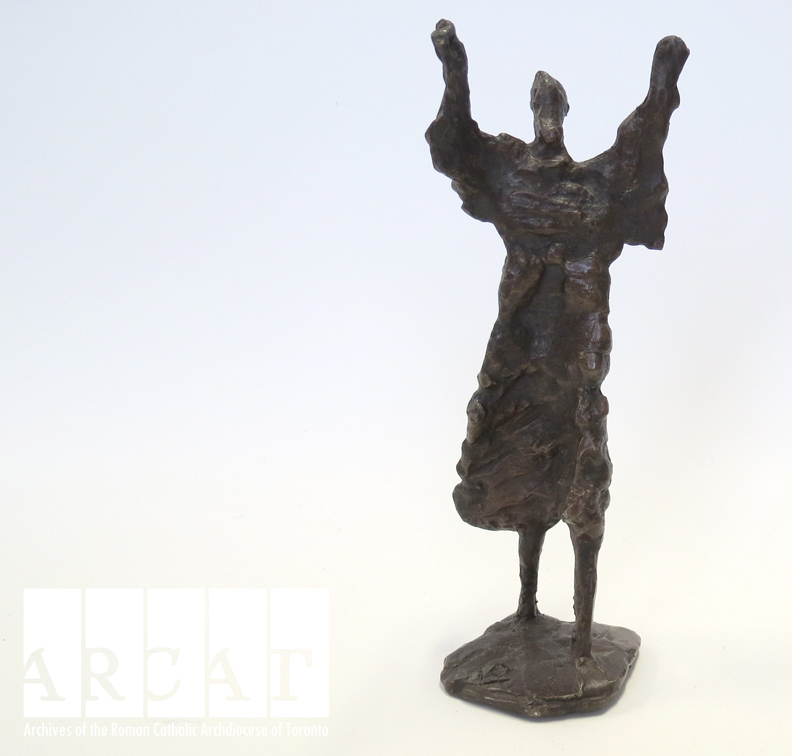 This bronze statue was given to Cardinal Carter by the Caritas Family Association in 1995.Unfortunately the piece does not have an artist's name or mark. This statue is also from the Cardinal Carter estate. 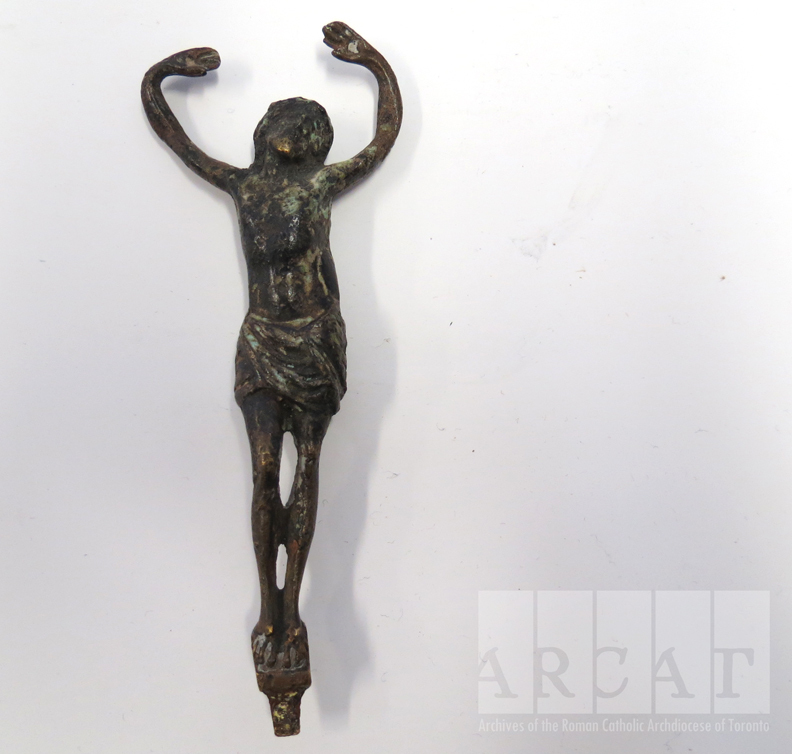 This figure of the crucified Christ is another from the Cardinal Carter estate. Perhaps he was fond of bronze! 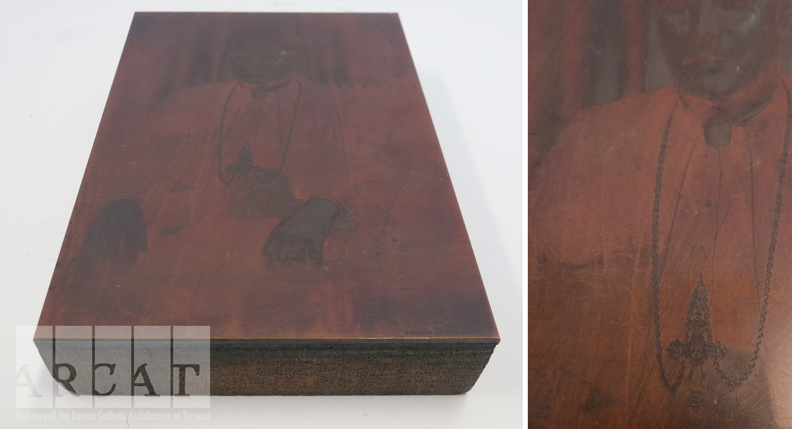 And for something completely different, this is a bronze printer's plate of a photo of Bishop Allen. 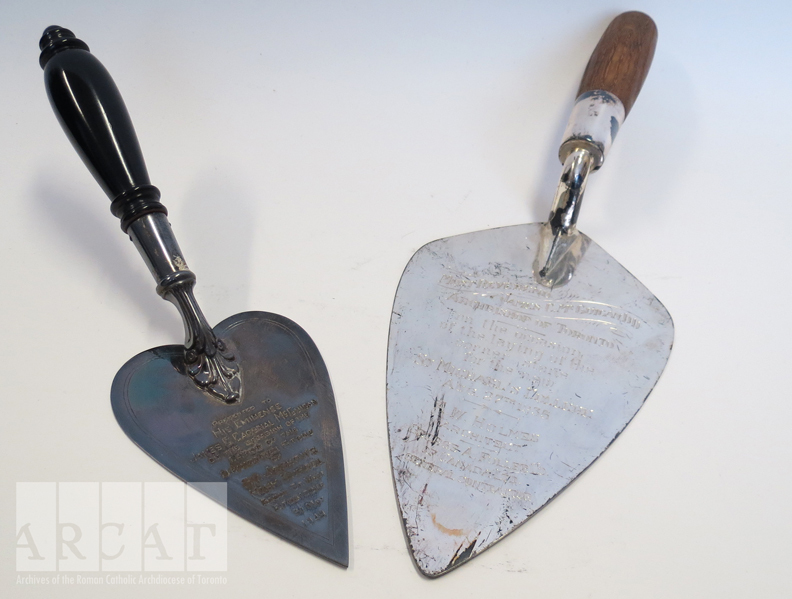 Two silver trowels presented to Cardinal McGuigan for laying cornerstones for St. Joseph's High School in Etobicoke in 1947 and St. Michael's College in 1935. This ice pitcher was presented to Archbishop Walsh on the occasion of his 25th year as a bishop by the 'pupils of Loretto Convent' in 1892. 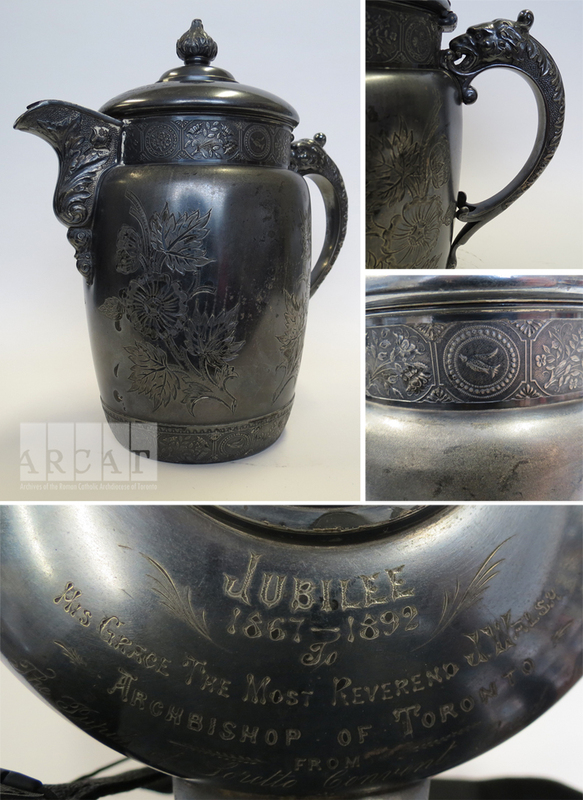 The pitcher made by the Acme Silver Company in Toronto is double walled to keep water cool. You can find it in the company's catalogue here. 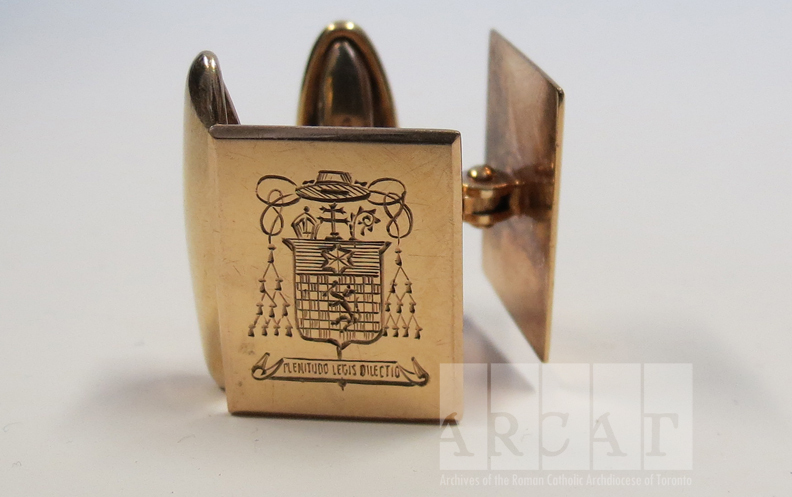 The Ancient Order of Hibernians also presented Archbishop Walsh with a water pitcher for his jubilee, but this one is a bit fancier. 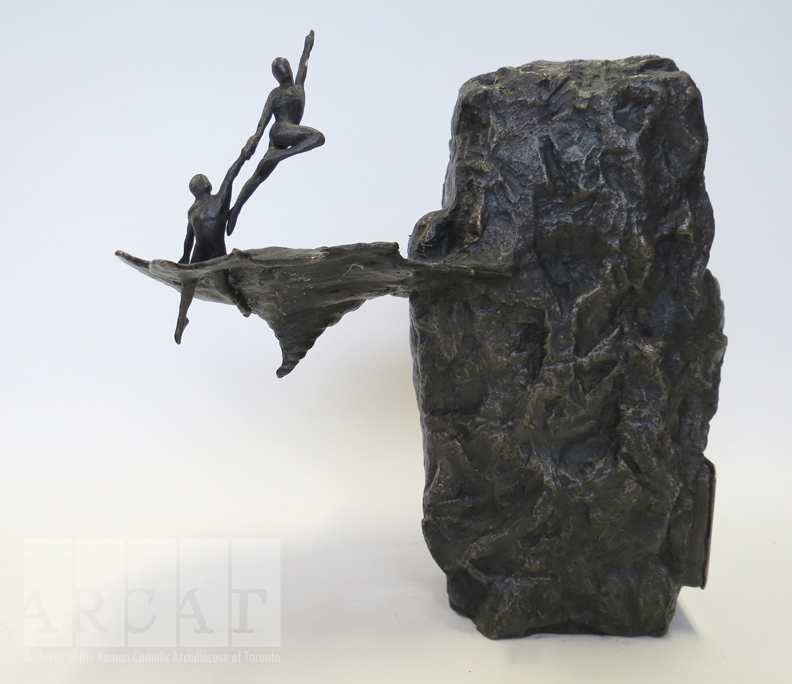 It rests on a stand and tilts so that guests have an easier time handling it when it is heavy. It includes a place to rest your cup. 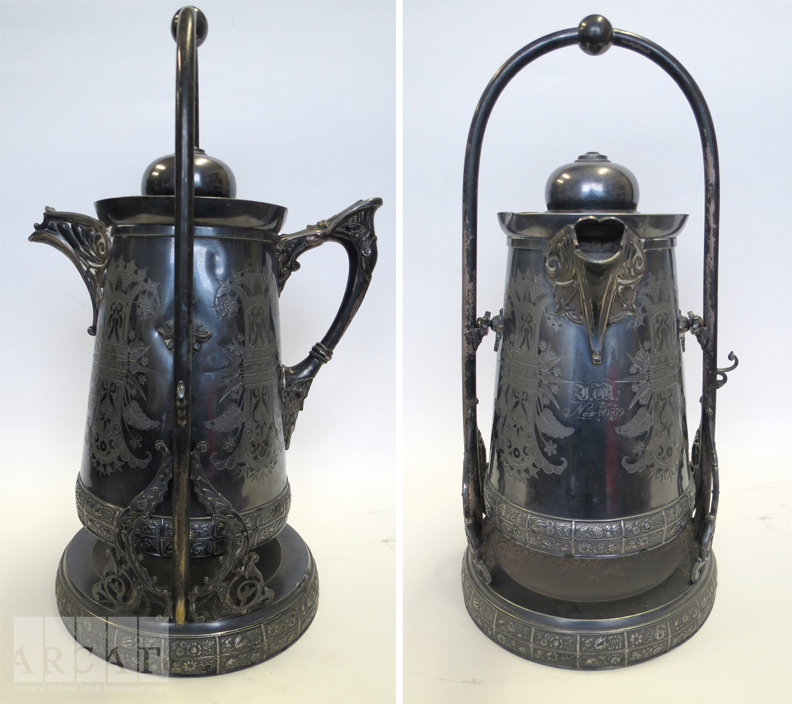 This victorian tilting set can also be found in the catalogue listed above. Apparently tilting sets were popular gifts in the latter half of the 19th century. 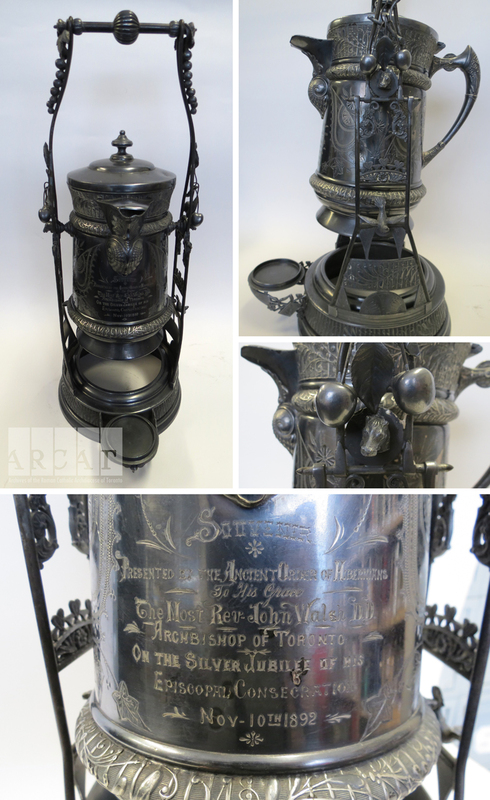 Archbishop Walsh received this one on the 25th anniversary of his priestly ordination in 1879. Before they came to ARCAT, the two Victorian tilting sets in our collection were on display outside Cardinal Carter's office in the old chancery building downtown. And in first place, gold! 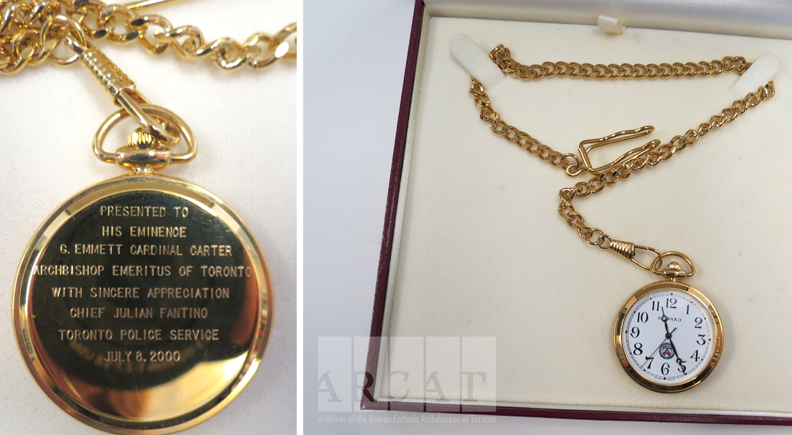 This gold pocket watch was presented to Cardinal Carter by Chief Julian Fantino on behalf of the Toronto Police Service in 2000. A pair of 10k gold Birks cufflinks belonging to Archbishop Pocock with his coat of arms. 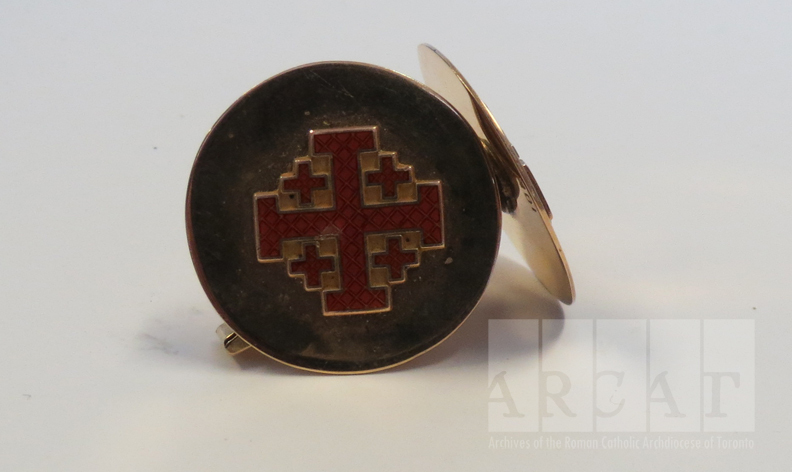 Another set of gold cufflinks belonging to a member of the Knights of the Holy Sepulchre. Let's wish our Canadian athletes luck in bringing home some silver, bronze and gold!